Young Galaxy just celebrated the release of their new Ultramarine LP last week, but the band are also toasting an earlier entry into their catalogue via a new limited vinyl repress of their sophomore set, Invisible Republic. Paper Bag Records has pressed the Invisible Republic onto wax for the very first time, and like a recent CD re-release, it includes two bonus cuts ("Flux" and "Invisible Republic"). You can hear "Flux" in the player down below. As for the vinyl itself, it's pressed on "blood-spattered ice" wax. The package also comes with a bonus CD of the album. 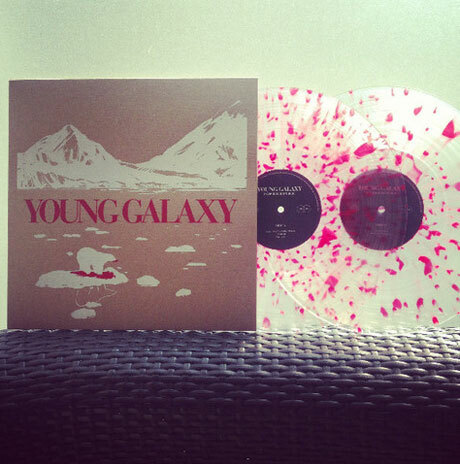 Only 300 copies of the record were made, and you can nab them while they last either via Paper Bag's web store or at a Young Galaxy show. You can see the outfit's global show schedule over here.